Josh James in action against Saturday’s opponent’s, Folkestone Invicta, in the Emirates FA Cup. The Hillians are back to Kent this Saturday, as we face Folkestone Invicta, this time in the Bostik Premier League. Just 7 days ago, the Hillians were celebrating a superb 1-0 victory in the Emirates FA Cup against Folkestone Invicta, thanks to Ben Pope’s 61st minute strike. Now, it’s back to Bostik Premier League action, but the opponent has stayed the same, as it’s, again, Invicta going toe-to-toe with Ian Chapman’s men. Ian Chapman will be hoping his side can make it three consecutive victories, having progressed in two cup competitions over the past two weeks. 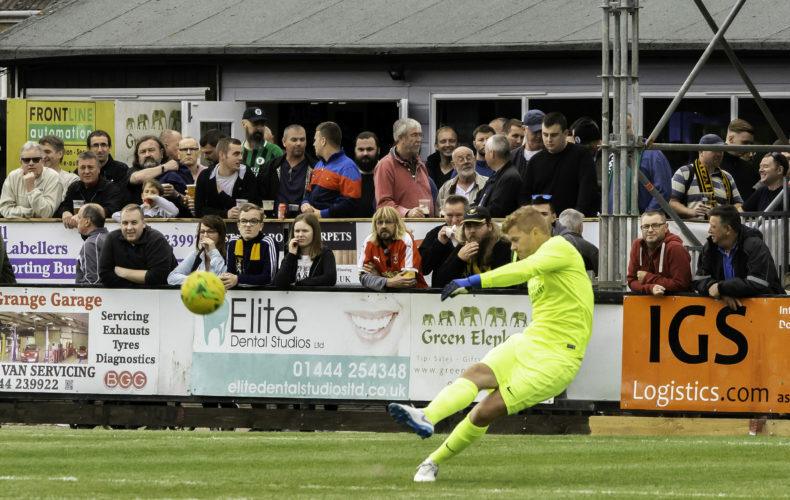 A professional performance at Faversham, and a brilliant display at home to Folkestone, has seen the Hillians progress into the Second Round of the Velocity Trophy, and the Second Round Qualifying of the Emirates FA Cup. Our hosts for the afternoon will certainly be looking for revenge, and will be hoping they can maintain their excellent start to the Bostik Premier League campaign. Neil Cugley’s men have picked up 12 points out of a possible 18, but have been beaten twice at home – which will provide the Hillians with confidence going into the afternoon. Safe travels to all you Hillians making the journey to Kent, reminder that the M20 will be closed over the weekend, so please allow extra time for your diverted route into Kent.